A VISIT TO THE (FORMER) MURDER CAPITAL! DUKE, THE BEAGLE, HAS ARRIVED IN PANAMA! CANAL EXPANSION EXCITEMENT–AND WE WERE THERE! 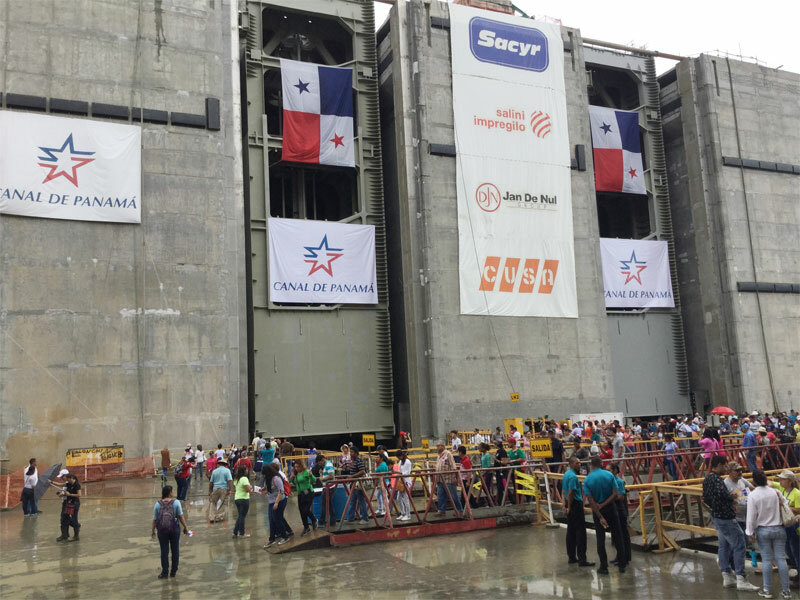 Over the past 8 years, Panama has been building new locks for the Panama Canal on the Atlantic and Pacific sides. The reason for the new locks is that, since the original Canal was built & commissioned in 1914, ships have gotten much bigger and many are now too wide to go through the existing locks. The expansion locks are, for all intents and purposes, completed and ready for the water. 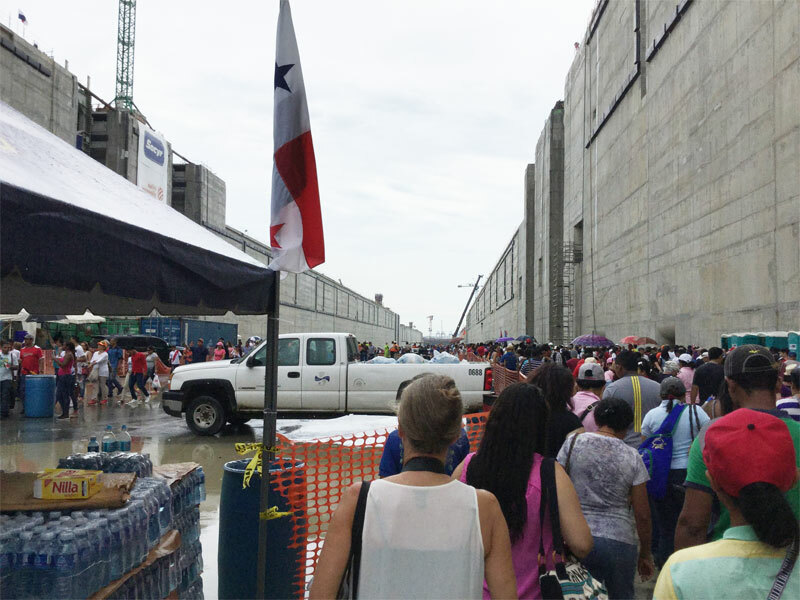 BUT before the flooding, the government of Panama and the Canal Authority thought it would be a wonderful thing to offer to everyone a completely free tour! We were all over that! 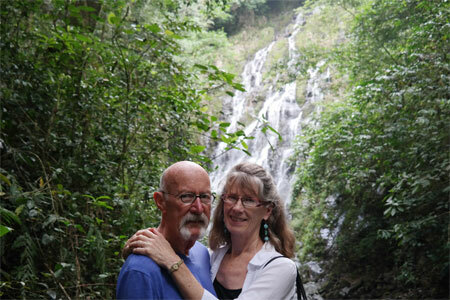 Frank and I drove to Panama Pacifico (on the Inter-American Highway) on Sunday morning, May 17 and parked our car. It was pouring rain, but who cares? We put up our umbrella and walked over the overpass & to a park on the other side of the highway to wait in a very, very long line of people who had the same idea we had–mainly, this is a once-in-a-lifetime opportunity! I have to say, everything was very orderly and we were some of the extremely few “gringos” in the line. 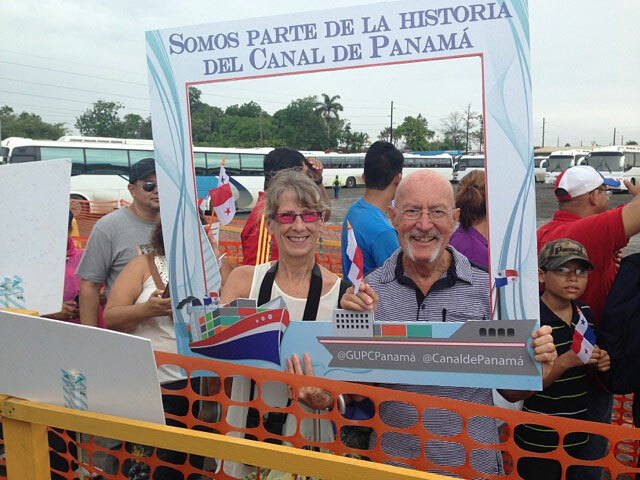 The Panamanians are tremendously proud of their Canal–and rightfully so. This expansion project was undertaken years after the Canal was turned over to the Panamanians and they have done a great job! After waiting in line for over an hour, we boarded one of many school buses to go to the next staging area, where there was another very long line of folks waiting to board the tour buses that took us down into the locks. Now, if it were not for our advanced age, we would have stood in that line for probably another 1 1/2 – 2 hours. 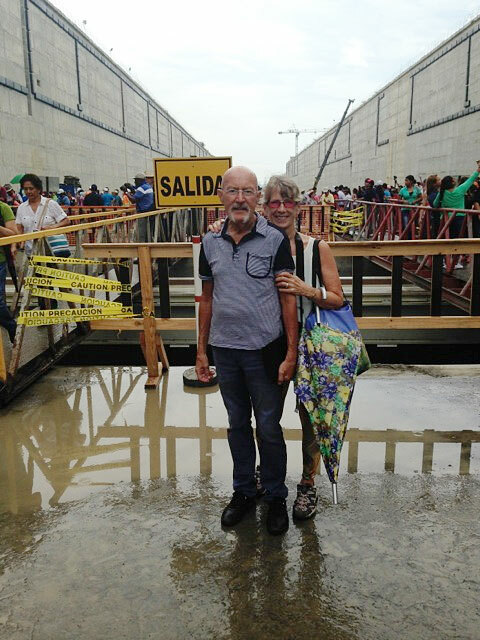 But, because Panama has a kind of reverence for the “Jubilados” (see our newsletter from April), we were invited to advance to “Go” and get right on the comfortable tour bus that then took us to the locks. On the way, we were given small Panama flags and offered bottled water at no charge–by the way, everything was free for visitors! How exciting! There we were in the bottom of these massive locks, marvelling at the massive doors for the chambers–manufactured in Italy–and tracks for operation, oohing and aahing at the system for letting the water in and out of the locks, amazed at the gigantic-ness of it! This is truly impressive! I have to say that it was surreal, standing at the bottom of what will soon be the waterway for those huge cargo ships to enter and exit the canal. It was a real party! Sorry we can’t invite you to do the same–this was it! Although they will be flooding the chambers beginning in June, they do not expect to have commercial traffic in the new locks until June of 2016. They have to test & adjust many, many times before that happens. But, you know, the Canal is an amazing thing. If you haven’t seen it, you should think about making a visit to Panama to see the locks in operation (the existing Miraflores locks on the Pacific side or the Gatun Locks on the Atlantic side) and perhaps take an excursion on the Canal. How exciting! If you would like information on Panama, accommodations, tours, etc., please just send us an email at fpb@anamericaninpanama.org. We will be happy to help you! For those of you who have been thinking about buying part of the Mango Farm but have been dragging your feet, here’s the newsflash: From June 1, there will be no more mango farm available for investors. The statement from the developers is, “We want to keep the Lady Victoria mangoes as extremely high end and exclusive when we are selling them fresh into the market.” Remember, these mangoes have the best pulp for taste, smaller seed and thicker skin and an 85% to 15% fruit to seed & pulp ratio. High quality and limited availability will produce a premium price when it comes time to sell the fruit and provide a return on investment to the owners. Although the project is technically sold out, due to our close relationship with the developers, we can still bring reservations for purchase. SO, this really is your last chance. If you want to get in on this at the 11th hour, call or email us as quickly as possible and we will get the reservation form to you. There is no deposit required with the reservation. A Short Trip to Colombia for a Double Hit! Cashew!